Home › Technical Analysis › Trading opinion › ASX 200, Daily Chart, August 17. 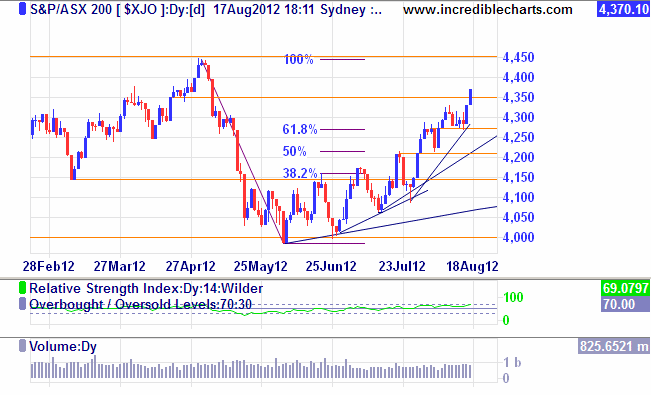 ASX 200, Daily Chart, August 17. After a pause from trending at the end of last week which continued on into the first 3 days of this week, the last two trading days saw buyers in complete control, resuming a very strong uptrend, and penetrating the next support/resistance level at 4350 to reach a high for the day on Friday at the close, of 4370. This strong finish for the week suggests further strong gains next week towards the next resistance target at 4450. However the RSI is now at 70, the lower boundary of the over-bought zone. Despite the more optimistic sentiment in the market, it is possible that instead of further gains, we could see a further pause in trending or even a pull-back, but one which we would hope would respected support at about 4275, thus continuing the present upwards trend. After the XJO index has risen over a period of nearly 3 months, further buying strength in the market could be a good opportunity to take profit.